"Highland Line" redirects here. For the railway lines, see Highland Main Line and West Highland Line. The Highlands ( Scots: the Hielans, /ˈhi.lənz/; Scottish Gaelic: A’ Ghàidhealtachd [ə ˈɣɛːəl̪ˠt̪ʰəxk], 'the place of the Gaels') is a historic region of Scotland. Culturally, the Highlands and the Lowlands diverged from the later Middle Ages into the modern period, when Lowland Scots replaced Scottish Gaelic throughout most of the Lowlands. The term is also used for the area north and west of the Highland Boundary Fault, although the exact boundaries are not clearly defined, particularly to the east. 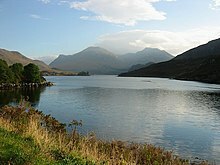 The Great Glen divides the Grampian Mountains to the southeast from the Northwest Highlands. 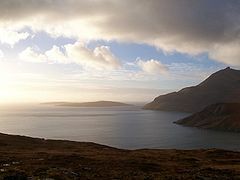 The Scottish Gaelic name of A' Ghàidhealtachd literally means "the place of the Gaels" and traditionally, from a Gaelic-speaking point of view, includes both the Western Isles and the Highlands. The Highland Council is the administrative body for much of the Highlands, with its administrative centre at Inverness. However, the Highlands also includes parts of the council areas of Aberdeenshire, Angus, Argyll and Bute, Moray, North Ayrshire, Perth and Kinross, Stirling and West Dunbartonshire. In traditional Scottish geography, the Highlands refers to that part of Scotland north-west of the Highland Boundary Fault, which crosses mainland Scotland in a near-straight line from Helensburgh to Stonehaven. However the flat coastal lands that occupy parts of the counties of Nairnshire, Morayshire, Banffshire and Aberdeenshire are often excluded as they do not share the distinctive geographical and cultural features of the rest of the Highlands. 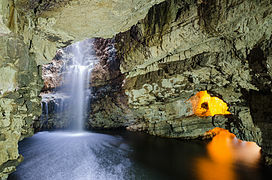 The north-east of Caithness, as well as Orkney and Shetland, are also often excluded from the Highlands, although the Hebrides are usually included. 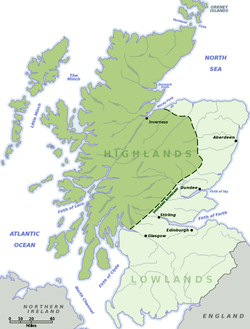 The Highland area, as so defined, differed from the Lowlands in language and tradition, having preserved Gaelic speech and customs centuries after the anglicisation of the latter; this led to a growing perception of a divide, with the cultural distinction between Highlander and Lowlander first noted towards the end of the 14th century. In Aberdeenshire, the boundary between the Highlands and the Lowlands is not well defined. There is a stone beside the A93 road near the village of Dinnet on Royal Deeside which states 'You are now in the Highlands', although there are areas of Highland character to the east of this point. A much wider definition of the Highlands is that used by the Scotch Whisky industry. Highland Single Malts are produced at distilleries north of an imaginary line between Dundee and Greenock,  thus including all of Aberdeenshire and Angus. The Highland Council area, created as one of the local government regions of Scotland, has been a unitary council area since 1996. The council area excludes a large area of the southern and eastern Highlands, and the Western Isles, but includes Caithness. Highlands is sometimes used, however, as a name for the council area, as in Highlands and Islands Fire and Rescue Service. Northern, as in Northern Constabulary, is also used to refer to the area covered by the fire and rescue service. This area consists of the Highland council area and the island council areas of Orkney, Shetland and the Western Isles. Highland Council signs in the Pass of Drumochter, between Glen Garry and Dalwhinnie, say "Welcome to the Highlands". Much of the Highlands area overlaps the Highlands and Islands area. An electoral region called Highlands and Islands is used in elections to the Scottish Parliament: this area includes Orkney and Shetland, as well as the Highland Council local government area, the Western Isles and most of the Argyll and Bute and Moray local government areas. Highlands and Islands has, however, different meanings in different contexts. It means Highland (the local government area), Orkney, Shetland, and the Western Isles in Highlands and Islands Fire and Rescue Service. Northern, as in Northern Constabulary, refers to the same area as that covered by the fire and rescue service. Although most of the Highlands is geographically on the British mainland, it is somewhat less accessible than the rest of Britain; thus most UK couriers categorise it separately, alongside Northern Ireland, the Isle of Man, and other offshore islands. They thus charge additional fees for delivery to the Highlands, or exclude the area entirely. Whilst the physical remoteness from the largest population centres inevitably leads to higher transit cost, there is confusion and consternation over the scale of the fees charged and the effectiveness of their communication,  and the use of the word Mainland in their justification. Since the charges are often based on postcode areas, many far less remote areas, including some which are traditionally considered part of the lowlands, are also subject to these charges. Royal Mail is the only delivery network bound by a Universal Service Obligation to charge a uniform tariff across the UK. This, however, applies only to mail items and not larger packages which are dealt with by its Parcelforce division. 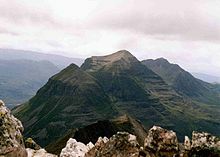 Liathach seen from Beinn Eighe. With the Munro "Top" of Stuc a' Choire Dhuibh Bhig 915 m (3,001 ft) in the foreground and the two Munro summits in the background. The Highlands lie to the north and west of the Highland Boundary Fault, which runs from Arran to Stonehaven. This part of Scotland is largely composed of ancient rocks from the Cambrian and Precambrian periods which were uplifted during the later Caledonian Orogeny. Smaller formations of Lewisian gneiss in the northwest are up to 3 billion years old. 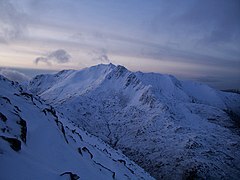 The overlying rocks of the Torridon Sandstone form mountains in the Torridon Hills such as Liathach and Beinn Eighe in Wester Ross. Highland Folk Museum- The first open-air museum in the UK. The Glenfinnan Viaduct from below. 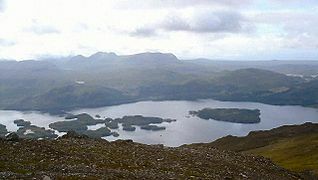 Wikimedia Commons has media related to Highlands. ^ "Highlands | region, Scotland, United Kingdom". Encyclopedia Britannica. Retrieved 10 May 2017. ^ a b c Richards, Eric (2000). The Highland Clearances People, Landlords and Rural Turmoil (2013 ed.). Edinburgh: Birlinn Limited. ISBN 978-1-78027-165-1. ^ a b "Highland profile — key facts and figures". The Highland Council. Retrieved 2 June 2014. ^ "Global Health Facts : Demography & Population : Population Density (Population Per Square Kilometer)". The Henry J Kaiser Family Foundation. Retrieved 2 June 2014. ^ Martin Ball; James Fife (1993). The Celtic Languages. Routledge. p. 136. ISBN 9780415010351. ^ Charles Jones (1997). The Edinburgh History of the Scots Language. Edinburgh University Press. pp. 566–567. ISBN 978-0748607549. ^ "The Highland Line". Sue & Marilyn. Retrieved 8 March 2013. ^ "Historical Geography of the Clans of Scotland". Electricscotland.com. Retrieved 8 March 2013. ^ Dodgshon, Robert A. (1998). From Chiefs to Landlords: Social and Economic Change in the Western Highlands and Islands, c.1493-1820. Edinburgh: Edinburgh University Press. ISBN 0 7486 1034 0. ^ a b Devine, T M (1994). Clanship to Crofters' War: The social transformation of the Scottish Highlands (2013 ed.). Manchester University Press. ISBN 978-0-7190-9076-9. ^ a b c d Devine, T M (2018). The Scottish Clearances: A History of the Dispossessed, 1600-1900. London: Allen Lane. ISBN 978-0241304105. ^ John Lenox Roberts (2002). The Jacobite Wars: Scotland and the Military Campaigns of 1715 and 1745. Polygon at Edinburgh. pp. 193–195. ISBN 9781902930299. ^ a b Marco Sievers (2007). The Highland Myth as an Invented Tradition of 18th and 19th Century and Its Significance for the Image of Scotland. GRIN Verlag. pp. 22–25. ISBN 9783638816519. ^ Deidre Dawson; Pierre Morère (2004). Scotland and France in the Enlightenment. Bucknell University Press. pp. 75–76. ISBN 978-0838755266. ^ William Ferguson (1998). The Identity of the Scottish Nation: An Historic Quest. Edinburgh University Press. p. 227. ISBN 978-0748610716. ^ Norman C Milne (2010). Scottish Culture and Traditions. Paragon Publishing. p. 138. ISBN 978-1899820795. ^ Richards, Eric (1985). A History of the Highland Clearances, Volume 2: Emigration, Protest, Reasons. Beckenham, Kent and Sydney, Australia: Croom Helm Ltd. ISBN 978-0709922599. ^ a b c d Devine, T M (1995). The Great Highland Famine: Hunger, Emigration and the Scottish Highlands in the Nineteenth Century. Edinburgh: Birlinn Limited. ISBN 1 904607 42 X. ^ Lynch, Michael (1991). Scotland, a New History (1992 ed.). London: Pimlico. ISBN 9780712698931. ^ Thomas Martin Devine (1999). "Chapter 18". The Scottish Nation. Penguin Books. ISBN 978-0670888115. ^ James Hunter (1974). "The Emergence of the Crofting Community: The Religious Contribution 1798–1843". Scottish Studies. 18: 95–116. ^ Ian Bradley (December 1987). 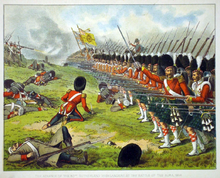 "'Having and Holding' - The Highland Land War of the 1880s". History Today. 37 (12): 23–28. Retrieved 8 March 2013. ^ Ewen A. Cameron (June 2005). "Communication or Separation? Reactions to Irish Land Agitation and Legislation in the Highlands of Scotland, c. 1870–1910". English Historical Review. 120 (487): 633–66. doi: 10.1093/ehr/cei124. ^ George Robb (1990). "Popular Religion and the Christianisation of the Highlands in the Eighteenth and Nineteenth Centuries". Journal of Religious History. 16 (1): 18–34. doi: 10.1111/j.1467-9809.1990.tb00647.x. ^ Gerard Seenan (10 April 2006). "Fury at ferry crossing on Sabbath". The Guardian. Retrieved 8 March 2013. ^ Cook, James (29 March 2011). "Battle looms in Outer Hebrides over Sabbath opening". BBC News. Retrieved 3 June 2014. ^ "Whisky Regions & Tours". Scotch Whisky Association. Retrieved 8 March 2013. ^ "Inverness: Capital of the Scottish Highlands". Internet Guide to Scotland. Retrieved 8 March 2013. ^ C Michael Hogan (22 November 2007). "Elsick Mounth - Ancient Trackway in Scotland in Aberdeenshire". The Megalithic Portal. Retrieved 8 March 2013. ^ a b "3,000 angry Scots respond to CAB survey on rural delivery charges". 2012 The Scottish Association of Citizens Advice Bureaux - Citizens Advice Scotland (Scottish charity SC016637). 25 January 2012. Retrieved 31 July 2013. ^ John Keay, Julia Keay (1994). Collins Encyclopaedia of Scotland. HarperCollins. ISBN 9780007103539. ^ William Hutchison Murray (1973). 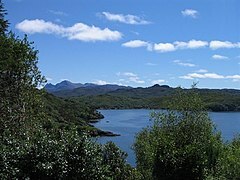 The islands of Western Scotland: the Inner and Outer Hebrides. Eyre Methuen. Lairds of Battle - Warfare in the Highlands in the sixteenth and seventeenth centuries.